Total organic carbon (TOC) is a measure of the organic carbon contained within soil organic matter. Organic carbon in soil is a result of the decomposition of plant and animal matter, living and dead microorganisms, and soil biota. TOC affects soil characteristics including color, nutrient capacity, nutrient stability and turnover, water relationships, aeration, and cultivation. TOC is the main source of energy for soil microorganisms and affects plant growth as a source of energy and a trigger for nutrient availability. Measuring TOC can provide information on soil fertility, aggregate stability, and the exchange of CO2 with the atmosphere – important information for environmental research and precision agriculture studies. Typical bands of interest for TOC in a soil spectra include features at 1100, 1600, 1700-1800, 2000, and 2200-2400nm. The high resolution and sensitivity of Spectral Evolution field spectroradiometers allows researchers to focus on TOC features. The SR-6500, SR-5400, PSR+ and RS-3500 are rugged field spectroradiometers designed for high resolution, enhanced sensitivity, and reliable operation. With fiber mount options and a sample contact probe, you can take these spectroradiometers right into the soil pit for fast and accurate soil scans. Our DARWin SP Data Acquisition software will save your scans and metadata as ASCII files for easy import into 3rd party analysis software like ENVI, GRAMS, R or Unscrambler. These spectroradiometers are ready to start scanning in minutes and have auto-shutter, auto-exposure, and auto-dark correct for scanning without manual optimization between scans. 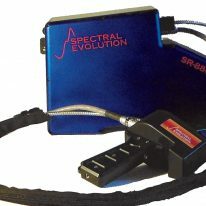 Lightweight, sealed units, with an all solid state design with no moving parts makes Spectral Evolution spectroradiometers ideal for rugged and reliable field use.